Here’s a recent naming contest we read about on the Wired Blog Network – go for it! With the recent detection of seasonal Martian methane emissions — which microbes could be generating or eating, NASA’s next robotic mission to the planet could become the most exciting unmanned mission in the history of the agency, especially if it discovers definitive evidence of extraterrestrial life. 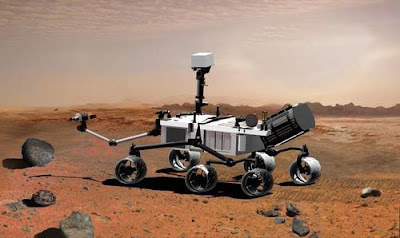 NASA claims the rover, which currently goes by the painfully dull name Mars Science Laboratory, will be the most capable rover ever, with a larger payload of more sophisticated instruments. Originally scheduled to launch in October 2009, “testing and hardware challenges” have pushed the date to the next window when Mars and Earth are favorably aligned in fall 2011. The rover’s main task is to answer the burning question of whether the red planet ever was, or still is, habitable for microbial life. We think a rover with such a cool mission mission needs a better name. Even NASA honchos know: They are holding a kid-centric naming contest sponsored by Wall-E to replace the current dry moniker. Call us homers, but we have more faith in Wired Science readers than we do in your little cousins to come up with the type of awe-inducing name that will fit the next-gen rover. After all, you did an inspiring job with the Mars Phoenix Twitter epitaph contest. So, we’re introducing another Reddit widget below for you to go wild with. You can submit your own name and vote on others through Jan. 26. We can’t promise that NASA will have anything to do with our official nickname, but we will link it from our future stories on the rover. To Submit a Rover Name to Wired, click on the original blog post and scroll to the bottom of the page.